I'm just about recovered from the show at the NEC and now busy making things for my Christmas market stall. The show was busier than ever, and Wendy and myself were demonstrating for the entire four days. Thank you to everyone who came to the stand and for all the wonderful comments about our demonstrations and samples - makes all the hard work worthwhile! Of course, Wendy was showing how to use her beautiful Majestix stamp range....the cards she was making were just stunning and everyone was very inspired. 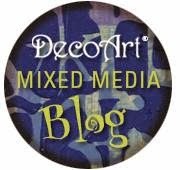 I was using Viva Decor and Deco Art products and using mixed media techniques...very messy...my default mode! It was so busy that the main products I was using were all gone by the end of day two, so, with another two days to go, I had to work off the cuff so to speak, and come up with new ideas, changing things as I went as more things sold out....very nerve wracking but it's good to have to think on your feet! ....the large snowflake is made using the Tim Holtz Alterations die "Layered Snowflake" which contains a die and matching embossing folder - really like this set. I used Deco Art white modelling paste to create the snow, sprinkling it with Glamour Dust. ...all made from paper except for the poppy wreaths which were crocheted. At the entrance to the Crafts For Christmas hall there was another display, this time featuring "The Snowman" - as I love snowmen I had to get my picture taken with him! I got back from the show on Sunday evening and then spent Monday relaxing on the sofa catching up with Strictly Come Dancing and a few other TV programmes - didn't even feel guilty! I was so glad to be back home with Thomas and Tara who were very happy to see me. My neighbour told me that Thomas had been sulking for England! On Sunday night Thomas crept under the duvet with me and, amazingly, so did Tara....this is a minor miracle as usually Tara won't even stay in the same room with Tom! They do seem to be getting along a little better at last. Yesterday was the third anniversary of dad's passing, so Heather and I went to St Chad's and laid some flowers at his resting place as well as lighting candles and looking in the memorial book which was open at the date and had dad's name written there. Being Armistice day makes the anniversary even more evocative. It also means that I've been back here in Poulton for three years now which seems unreal - although I also feel I've been here forever at the same time. Time....such a strange thing that seems to ebb and flow depending on what we are thinking about, remembering or looking forward to. Well, we also did some shopping and Heather even brought me a food parcel - including plenty of cat food - so I am well stocked up now. It was so cold and dank yesterday that I was relieved to get home and look forward to some time inside without having to go out again. With a full larder and fridge I can batten down the hatches and just get busy with making things to sell on my Christmas Market stall in December. I've just finished adding texture and embellishments to some MDF ornaments which are now drying as I have this little break. They'll then be painted black before I start adding all the lustre and sparkle. I do have to go out this evening though, as it is the town Forum meeting...lots of important issues so I don't want to miss it. The police, councillors and local MP will be there, so it's a great chance to put things to them and get things done! There is an amendment to my demo dates as we have postponed the one at Card-io in Wigan which I was meant to be doing this coming Saturday. because all the products sold out at the show, I will now be going there on Saturday 29th November where I'll be showing the Mixed Media techniques and giving ideas for Christmas gifts and decorations. I'll be returning on Saturday 28th February when I'll be teaching Mixed Media workshops - more details to follow, but if you want to ensure a place, please get in touch with Card-io directly here. Well, I think those decorations will be dry now, so I shall get cracking with the next stage. I need to get an awful lot of things made by 5th December! I know you are extremely busy but is there a chance that you might be able to do one for me please? Would totally understand if you cannot do it. Your mixed media gilded layers technique is fabulous and everyone is having a go at A Maze of Memories. I LOVE your Christmas panels - gorgeous!! !